Debbiedoo's: So you think you can create? So you think you can create? I tell you these gals just never cease to amaze me! First, with their generosity and now with all their creativity and thought! have something pretty awesome to share with you. You may recall they are one of the stockists for Annie Sloan's chalk paint. 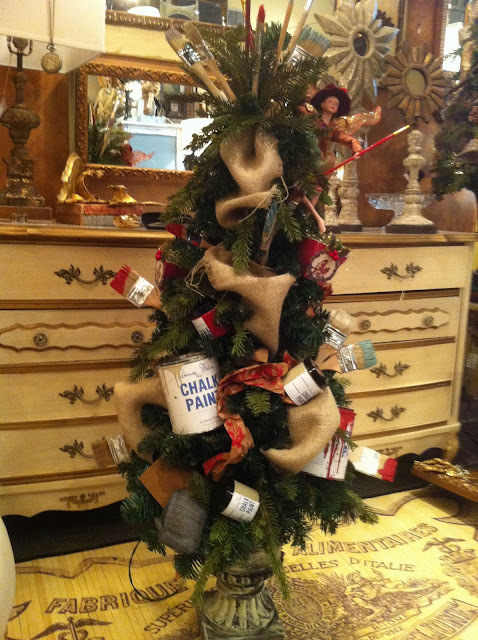 Look at this cute Annie Sloan Christmas tree! Now go on over and see what's cookin up for the Season! Wowwwwwwwwwwwwww - that's really cool! You are too funny ...lol....and talented. That would look good in Home Depots window if they had any. Have no clue Diane what I did on that date...fixed now, thank you. I am having so much fun. Thank you for hosting the Newbie Party. The talent and creativity that these women have is simply amazing. My head is spinning ....so much to see. Just visited Robyn...that tree...so cute! Have a great day. Great!! You do so many creative things...always enjoy seeing them. Hi Debbie, That is quite the tree, love it. I'll have to share some pictures of a tree I did for my god child for Christmas a few years back. Hope you have a great day! Now, that's waaay too cute. Thank you too for your comment and your vote, Debbie!!! I really, REALLY appreciate your help! Upcycled wood pallet #2, Newbie party started!